Spacious ski in double condo prime base area location by Mountaineer Square. 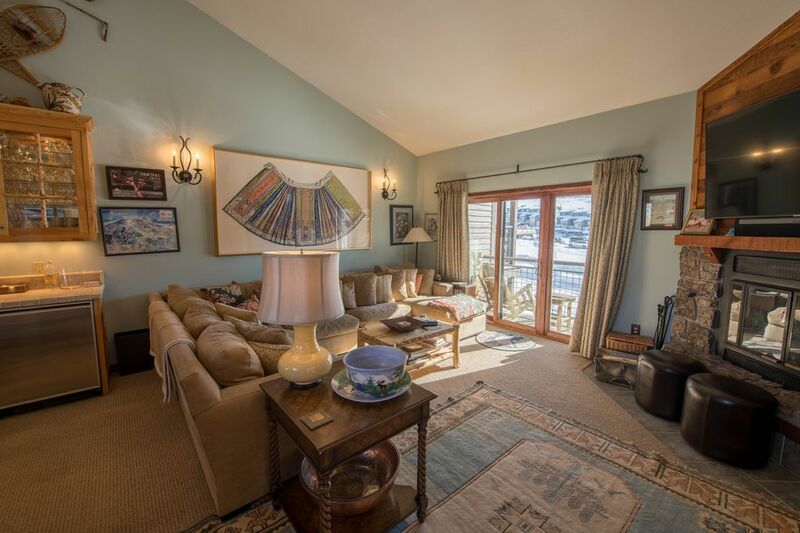 Four bedroom, 3 baths, 2 half baths, sleeps 8 adults, in one king, one queen and 4 twin beds, beautiful condo on mountain in Crested Mountain Village section. Walk to all facilities and stores on the mountain. Two fireplaces, three balconies with spectacular views. Office has a printer for guest use. Ski in and easy walk out to base lifts, Summer Concerts, Mountain Biking and hiking on the mountain. Next to Transportation Center for easy access to town of Crested Butte. It is hard to beat this great family location. Convenient for everyone. Two parking spaces. No smoking, no pets. Keywords: Large double Condominium in Crested Mountain Village near lifts and Crested Butte Summer Concerts. Hear the Music from the Balconies. Great views of the fire works. We came to Crested Butte in 1998 and as family fell in love with the skiing, the outdoor lifestyle and the community. We love the town, the beauty of the West Elks and East River Valley and the unspoiled nature of the area. The skiing is fantastic and uncrowded. The Crested Butte experience makes it well worth the travel time whether coming to ski, to enjoy the wildflowers or the incredible turning of the Aspens during the fall. Give it a try and you will see why we bought a second home here. Twenty years later, we co-own The Mountain Store and CB Kids with a life long friend. Two of my four sons live here. Another recently left to go graduate school. We will be as helpful as we can to ensure that you have a wonderful visit to Crested Butte. When we bought, I had four sons 12 and under. I wanted a place where they could be independent, close to everything and safe from traffic. It was originally two condominiums that we joined as one. For the time being the second master on the top floor is locked off for family use but there is still a king and queen bedroom with bathrooms en suite. The Crested Mountain North complex is in an ideal location with easy acess to ski in close to the front door and to walk out easly to the lifts. Walk out the door for beautiful hikes on the Mountain or to Mountain Bike trails, disk golf and the Crested Butte Mountain Adventure Center In addition, it is less than two minutes to the bus to Crested Butte and to the base area stores and restaurents. It makes it easy for everyone to be independent. The views are fantastic and the condo is well lit with natural light. the location is fabulous for year around visitors. Private balconies for mountain firesworkd and festivities on the fourth of July and during the Winter Holidays. toilet, combination tub/shower, Hall bath for the two twin bedrooms. This half bath is en suite to bedroom four. The bus stop to downtown can been seen from the balconies. It is 50 yards away. We look out at Crested Butte Mountain Resort and see most of the base area. We are in the heart of Crested Mountain Village with ski and bike shops close by. We have gorgeous views of the Butte steps away from the lifts. Condo also has balconies looking towards Whetstone. with good snow conditions, you can ski to the condo. It is a short walk out to the lifts. TVs in two bedrooms, kitchen and large screen in living room. Service provided by Spectrum. Public courts on the mountain and in town. At the Crested Butte Country Club and at Dos Rios in Gunnison. I play both and like them! This was by far one of the best condos we have rented. Rosalind has thought of every detail and it’s the perfect place for a family gathering. I did not ski so I spent most of the time at the condo... and it was quite a treat. All bedrooms are on a separate floor from the living area so it worked well for our family of late sleepers! You will not regret booking this outstanding accommodation . We plan to come back!! This is a very nice property with all the amenities of home. A 5 minute walk and you're at the lifts, less than that gets you to good food and drinks. We had a wonderful time and will return. Thank you for staying at Ratherby II. I am glad you enjoyed our ski home. We look forward to your return! Wonderful family get-away to Mt. Crested Butte! We loved the setting provided by this beautiful Mt. Crested Butte condo! It is the perfect location, convenient to the slopes and restaurants and shops in the base area. Rosalind was incredible in orienting us as first-time visitors to Crested Butte. We would highly recommend this property as a great headquarters for adventures in the Crested Butte area. We shave stayed in many condos at Crested Butte for our annual ski trip and this was by far the best. This huge 4 bedroom has everything you could ever want and made 7 adults feel at home. Never felt crowded unlike other places we have stayed. Living area and kitchen are HUGE. Pictures don’t do this condo justice. 2 fireplaces and TV in living room is giant and WiFi is fast. Incredibly convenient and was truly ski in to the front door and walk to slopes was 2 minutes. Lot of ski storage at front door. Incredibly well appointed and comfortable. Rosalind was extremely helpful and responsive. Really can’t think of how it could have been better unless I owned it. Already making plans to stay there next year. Great location and well furnished kitchen! Very comfortable and well furnished. Rosalind was very helpful. Outstanding home perfect location to ski Crested Butte! This property was everything and more for our two families. The condo was absolutely perfect for the 7 of us to stay, ski and ring in 2018. We enjoyed the views from the balconies as well as the fireworks on NYE. Here is my summary: Comfortable. Clean. Spacious. Well stocked kitchen. Great views. 2 fireplaces. Convenient. Would stay there every year! Our Crested Butte home is in an excellent location near all of the base activities in winter and summer. Watch the bikes and skiers come down. Go over to the Adventure park. Catch the bus into town right next to condo. When booking, guests agree to the following terms:CANCELLATION/DEPOSIT POLICY:50% Reservation Deposit is due at the time of booking the property. The rent balance including security deposit, taxes and cleaning charge is due 45 days prior to arrival. The full amount, less booking fee ($500.00) is refundable if cancelled 90 days or more prior to arrival. Reservation Deposit is nonrefundable less than 90 days prior to arrival. Full amount, less security deposit, cleaning and tax is nonrefundable if cancelled less than 45 days prior to arrival. Reservation may be cancelled by owner if deposits are not received when due. In the event, tenant cancels reservation, landlord will attempt to rebook property with another guest at the same rate and same dates. If a full or partial replacement booking is executed, the Landlord will return to tenant the proceeds minus booking fee and any cost derived from the new booking.The rate and payment schedule is in the VRBO/Homeaway statement. Landlord may deduct any cleaning charges in excess of eight hours from the Security Deposit. Tenant shall not use the security as rent. The security shall be placed in a non interest bearing account in Landlord's name. The Premises shall be occupied only by Tenant, Tenant's immediate family and guests and shall be used only for residential purposes. No more than eight people may occupy the premises. The Premises may not be used for illegal, immoral, or improper purposes. No more than two vehicles may be parked at premises. Tenant shall not assign the Lease, sublet the Premises, or permit the Premises to be used or occupied by anyone other than Tenant.Tenant shall take good care of the Premises and Landlord's appliances and furnishings and shall maintain them in good order and condition, ordinary wear and tear excepted. Landlord may repair at Tenant expense, any damage to the Premises resulting from the misuse or negligence of Tenant. No pets shall be kept in or about the Premises.